In recent years, schools have started introducing more inclusive syllabi emphasizing the works and ideas of previously overlooked or underrepresented writers. Readers of all ages can now explore the rich contributions of writers from around the world. These writers have various backgrounds, and unlike most writers from the U.S. or the United Kingdom, information on them in English can be difficult to find. 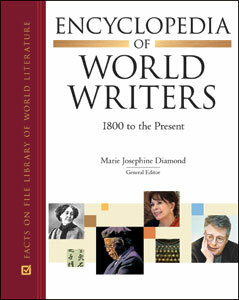 Encyclopedia of World Writers: 1800 to the Present covers the most important writers outside of the U.S., Britain, and Ireland since 1800. More than 330 insightful, A-to-Z entries profile novelists, poets, dramatists, and short-story writers whose works are anthologized in textbooks or assigned in high school English classes. Entries range in length from 200 to 1,000 words each and include a biographical sketch, synopses of major works, and a brief bibliography. Dozens of entries are new to this edition and many existing entries have been updated and significantly expanded with new "Critical Analysis" sections.